One of these jewels in Campania is Sorrento. 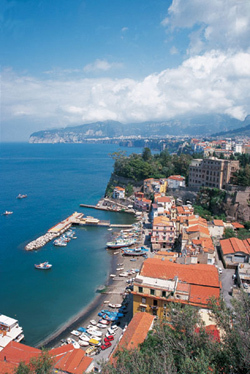 Sorrento is a pleasant town and one of the favourite destinations by tourists. The name “Surrentum” seems to be connected to the myth of Sirens. They were sea creatures, half women and half fishes, who bewitched the sailors with their voices. The charms of Sorrento are many, from the picturesque streets of the old city adorned by patrician villas, to the Marina Grande, a traditional fishing harbor and popular destination for a stroll. But the special charm that distinguishes it from any other town is represented above all by its particular morphology. Sorrento stands on high cliffs of tuff, which were formed from water erosion, giving them their present aspect. There are many itineraries very attractive in Sorrento. We'll arrange with a professional local English-speaking guide a visit on foot of Sorrento. 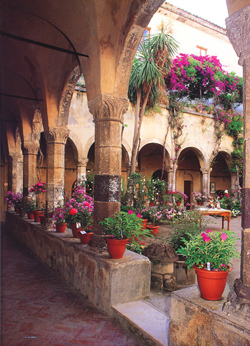 We'll walk along the old city centre in Via S. Cesareo, the heart of the town, and visit the beautiful Cloister of S. Francesco or the Cathedral in romanesque style that dates back to the fifteenth century. And we'll appreciate the beauty of Sorrento Cathedral. Sorrento is famous for the production of Limoncello, an alcoholic aperitif made from lemon rinds, alcohol, water and sugar. Other agricultural production includes citrus fruit, wine, nuts and olives. Wood craftsmanship is also developed. Sorrento was the birthplace of the poet Torquato Tasso (1544-1595), author of the Gerusalemme Liberata. Famous people who visited it include Lord Byron, Keats, Goethe and Walter Scott. This memorable excursion of Sorrento lasts roughly 2 hours and it takes place on foot.